The Rt. Rev. Brian Lee Cole was ordained and consecrated fifth bishop of the Diocese of East Tennessee on December 2, 2017. He was elected June 28, 2017, during the electing portion of the 33rd Annual Convention of the diocese, succeeding the Rt. Rev. George Dibrell Young, who retired December 2, 2017. Bishop Cole has under his pastoral and administrative care 51 parishes and worshiping communities in East Tennessee and Northern Georgia. The bishop’s responsibilities are to visit each congregation, preaching, celebrating the Holy Eucharist and confirming individuals into The Episcopal Church in the apostolic tradition of the laying on of hands. As bishop, he ordains priests and deacons and joins in the ordination of other bishops of the church. In these rites, through the laying on of hands, the continuity with the early church of the apostles is demonstrated. Bishop Cole presides over the annual diocesan conventions and has administrative responsibility over diocesan activities. A southeast Missouri native, Bishop Cole graduated from Murray State University in Murray, Kentucky, with a Bachelor of Science degree in Business Administration in 1989. 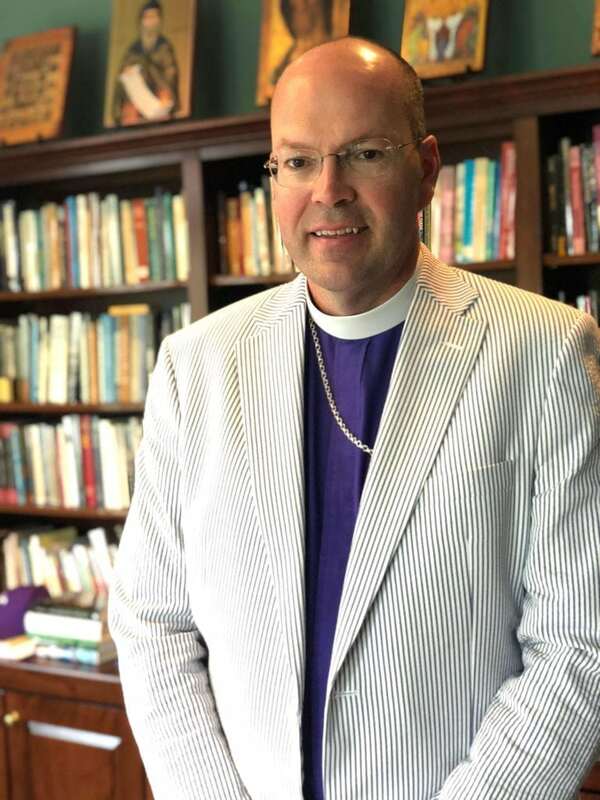 In 1992, he earned a Master of Divinity at the Southern Baptist Theological Seminary, with additional studies in Anglican Church History at The University of the South School of Theology, Sewanee, in 2001. He also pursued studies in Art and Prayer at General Theological Seminary (GTS), New York City, in 2006, and studied liturgics In Asheville, N.C., from 2002 to 2005. In 1998 he married Susan Weatherford, a poet, musician, avid gardener, and graduate of Berea College and University of Kentucky. They have one son, Jess. Ordained a priest in 2002, Cole served as vicar at Church of the Advocate, a worshiping community of the Diocese of Western North Carolina for homeless in downtown Asheville, North Carolina. From 2005 to 2012, Cole was sub-dean at The Cathedral of All Souls in Asheville. He served as rector at The Church of the Good Shepherd in Lexington, Kentucky, from 2012 until his election as bishop. Cole has served as an instructor in Appalachian Religion, Faith and Practices, and Appalachian Religion and Culture, at Warren Wilson College, Swannanoa. N.C.; Wake Forest University School of Divinity in Winston-Salem, N.C., and Luther Seminary, St. Paul, Minn. Prior to his ordination as a priest, he served for seven years on the staff of the Appalachian Ministries Education Resource Center (AMERC) in Berea, Kentucky. Much of his work then involved teaching seminarians, listening to Appalachian leaders, both in and out of the Church, and learning how to read and appreciate the culture of the region. He served on the Executive Council of The Episcopal Church 2006-2012 and on the Executive Committee of the Executive Council 2009-2012. He has chaired, facilitated, led, co-led and participated in numerous committees, training programs advisory boards, and retreats. Cole has twice served as a General Convention deputy – in 2006 and 2009. He is an associate of the Order of the Holy Cross. Cole has five times been a featured preacher on the Day 1 weekly radio broadcast/podcast. His articles, sermons and other writings have appeared in The Gospel and Our Culture; Natural Saints: How People of Faith are Working to Save God’s Earth; Sacred Acts: How Churches are Working to Protect Earth’s Climate; Green Pulpit Journal; Appalachian Heritage; Heartstone; Aging and Spirituality; Lutheran Seminary Review; Iron Mountain Review, and Creation Care. His reflections were included in Lent 2017 Living Compass Series, and an essay was included in Merton and the Protestants. Cole is an avid reader and runner, and loves listening to good jazz music. He ran the San Francisco Marathon in 2000 and ran the Shut-in Bridge Run in 2006 and 2008, which is considered to be the toughest trail race in the southeastern United States. The Bluegrass 10K is a road race routed directly by Good Shepherd and Cole ran it annually while living in Lexington.